Children can read (and be read to) from traditional print media (such as print books, magazine, newspapers, comic books, graphic novels, etc. ), or from electronic media (ebooks, online magazines, blogs, etc.). Regardless of what format they use, it is important for kids to develop and hone their reading skills as they are often essential for success in school, work, communicating with others and can even help foster creativity. young adults aged 16-29 read books mostly on a desktop or laptop computer, followed by a cell phone, e-reader, and tablet, according to Pew. Body image: Some magazines, graphic novels and comic books, especially those aimed at teens, can negatively affect how the reader feels about his or her body. Some magazines focus heavily on what to wear, how to apply makeup, or how to lose weight. Many of the advertisements and photos in magazines are digitally manipulated, so that the reader only sees a “perfect” and unrealistic body represented. The images often feature women who are underweight, and men who are overly muscular, and do not often portray multiculturalism. E-readers and physical concerns: Heavy users of mobile devices such as e-readers and tablets may find themselves making repetitive hand motions that can lead to hand and arm pain, or may hold a device in a certain position for a prolonged period causing elbow and shoulder pain. You may also experience vision problems such as computer vision syndrome by spending excessive amounts of time focusing on a small screen. E-readers and comprehension: Some research suggests that children understand text better when reading a print book rather than a digital screen. Understanding may increase once a child becomes familiar with reading from a digital platform such as a tablet. Content: There are many print and electronic media that are inappropriate for children. For example, there are some comic books that may be too violent for young readers and some literature for young adults may not be suitable for tweens. As with all media, make sure that the content is developmentally appropriate for your child or teen. 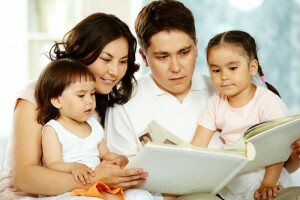 Knowledge: Young children who read about different topics can increase their knowledge of the world around them. Language: Research has shown that reading positively affects communication skills and language; as well as spelling and oral skills. Graphic novels can help support English-language learners and those students with disabilities. Entertainment: Books are available free of charge from public libraries, providing a low-cost form of entertainment for children. Reading for fun has been shown to reduce stress in children and increase their intellectual performance in vocabulary, language and math. Shared experiences: Reading aloud with your younger children is a positive activity, and increases parent-child interaction. Social skills: Pleasure reading can help teens develop compassion and empathy, empower them to act on what they believe and even help them understand the consequences that can come from risky behavior. Approach your local public librarian for advice on what books to recommend to your child or teen. Librarians are trained to provide readers’ advisory services, and they can generate a list of age-appropriate book recommendations based on what your child has previously enjoyed reading, or based on your child’s interests in general. If your child is reluctant, or seems uninterested in reading, an e-reader may help him become interested in books and form a healthy reading habit. Read book reviews and recommendations online. There are many sites that review books especially for children, and other general book recommendation sites like Good Reads that include a section for children’s literature. Talk with your kids about body image concerns. For magazines, look at the headlines on the cover and the pictures inside. Do they send conflicting messages? Are the messages about taking care of your body in a healthy way? Are the articles focused solely on appearance? Are the images realistic? Have an open conversation with your teen about how the messages make them feel. Actively engage your children in discussion about the books and comic books they read. On top of learning more about the content, your discussion will likely encourage them to think critically about the material. Ensure that your child is using an e-reader correctly. As with any screen media, monitor the amount of time they spend with the device, and encourage frequent breaks to prevent eyestrain and other physical strain.